What you need to know about coastal homeowners insurance. Many insurance companies are cancelling or non-renewing home policies written in coastal areas of the United States due to massive hurricane and other weather related losses. If you're like most Americans, your home(s) is the most valuable thing you own. You probably invested a large down payment in acquiring it, have spent plenty of money to maintain it, and built tons of equity over the years. What would happen if it was all taken away from you in the blink of an eye? All that investment lost. That's why we purchase homeowners insurance, after all. So that we can sleep easy at night knowing that our most valuable piece of property, our house, is financially protected. Even if it were damaged or destroyed, we wouldn't have to eat the cost. But for people living in the coastal states like California, Delaware, New Jersey, New York, and Texas - the threat of losing your home is even greater. Coastal waters bring the danger of floods, hurricanes, and more. That's why coastal homeowners insurance is especially important to invest in (and often required by mortgage companies). And lately, more and more insurers in areas bordering coastal areas are dropping coastal home insurance policies or non-renewing them as a result of massive losses from heavy storms. In this post, we'll talk about why you still need coastal homeowners insurance and offer tips for how to find a reliable policy. We'll also look at a few states most threatened by coastal storms and flooding. What Is Considered A Coastal Property For Home Insurance? An owner-occupied single-family coastal property provides living accommodations for an individual, a couple, one or more adults raising children, or a multi-generational family. The individuals living in the dwelling may be related by blood, marriage or other arrangement such as adoption, foster parenthood or a guardianship. The household may also own a pet(s). Owner occupied means that the property owner(s) live on the property and that the premises are not leased or rented out to others. Coastal property is located adjacent to a navigable body of water such as a river, ocean, or lake. It may be a secondary or vacation home and be unoccupied during part of the year. The on-premises exposure includes the land and all structures on that land, such as a garage, storage shed, or swimming pool. If the property is the principal residence, off-premises exposures include activities of the dwelling owner and all members of the household including students who live away from home as long as they are in school and are younger than 24. Why Do I Need Coastal Homeowners Insurance? Hurricanes cause more damage than any other natural disaster known to man, and every year they are responsible for 28 billion dollars of destruction. More than a million U.S. citizens are located in areas with a high risk of severe damage, and being caught without coastal homeowners insurance can be financially ruinous. Imagine if your $750,000 home (which you still owed $500,000 on) was completely destroyed by a coastal storm. Without coverage, you might have to pay that $3,000 mortgage every month for the next 20 years. When Do I Need Coastal Homeowners Insurance? The requirements vary from one insurer to the next, but the industry standard is that your provider will require you to purchase coastal homeowners insurance if you live within three miles of a coast. This area is most prone to the largest amount of damage, so it is wise to get as much coverage as you can reasonably afford if your home falls within this danger zone. How Should I Choose My Coastal Homeowners Insurance Policy Limits? Minimum recommended coverage: Homeowners, Flood, Wind/Hail, Personal Auto Policy, Personal Umbrella Policy & Boatowner/Yacht Policies. Other coverages to consider: Earthquake Coverage and Personal Inland Marine Policies (your belongings in the home). The need for coastal homeowners insurance varies greatly depending on where you live. One way to estimate your necessity is by looking at past instances of flood insurance claims in order to predict future dangers. California, which has more than 3,000 miles of coastline along the Pacific Ocean, was home to 337 flood insurance claims. While it's not exactly a hot bed of hurricane action, California homes along the coast are nonetheless still worth insuring against wind and other dangers of living along the coast. Small as it is, Delaware still saw 176 claims during the time period reported. That's about half of what California experienced, even though the First State's coast line is only 381 miles long. This high concentration of potential storm damage means that coastal homeowners insurance is vital for anyone living along Rehoboth, Lewes, Cape Henlopen, or any of the state's other beaches or coastal towns. New Jersey is a dangerous place when it comes to flooding. With 1,702 insurance claims spread over just 1,792 coastal miles, the ratio of flood claims to coastline is second highest on our list. The moral of the story: if you live on a NJ coast, insure your home. While it might not look like much of New York state touches the water, you've got to remember that the Big Apple is practically one big island (only the Bronx annexes to the mainland). Those 2,600 some miles of coast were subject to 233 flood claims. While that might not seem like too many, you also have to keep in mind that in 2017, five hurricanes came close enough to New York to affect its rainfall and wind, and that Irene and Sandy both had a major impact in 2011 and 2012, respectively. Believe it or not, Texas has almost as much coastal territory as California, but it was subject to more than 16,000 flood insurance claims in the reported time period. Texas, therefore, tops our list with the largest ratio of coastline to insurance claims. Personal liability exposures arise from conditions at the premises and the actions of the members of the household. However, these are heightened due to the potential for water-related incidents. The type and breed of family pets may also increase exposure. The age of any children, the social and civic organizations, and sports that the family participates in can all impact the loss potential. Although owners may not be responsible for injuries involving natural bodies of water, they may be held responsible for injury due to additions they make to items such as piers, docks, swings, ladders and other equipment used in and around the body of water. Pools, trampolines, tree houses, playground equipment, non-licensed motorized vehicles, and similar attractions must be secured to prevent young children from gaining unsupervised access. Property exposure includes the dwelling, its contents, and any related non-business structures and their contents located on the premises. 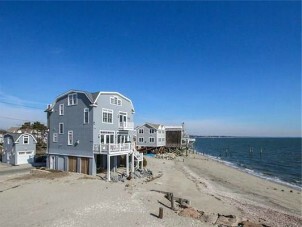 Coastal property is subject to climate damage from both good and bad weather conditions. If the property is ocean front, the deterioration is more rapid due to the high salt content in the water. Damp conditions and high water tables require contractors with knowledge of the area to prevent structural problems. Inadequacy of below ground construction increases the likelihood of water damage and mold problems. Maintenance is a priority since structures can deteriorate rapidly due to exposure to water and wind. Fire hazards include electrical wiring, heating, cooling, and cooking equipment. As coastal property is often located far from adequate public fire protection and inaccessible by fire equipment, any fire may result in a total loss. Existing water sources may be unavailable for fighting a fire. Isolated properties can be subject to vandalism and theft, particularly those occupied on a seasonal basis. Central station alarm systems and caretakers can reduce some of the isolation issues. The premises should be built to current code with recommended wind protection such as shutters. Vegetation should be trimmed and away from the structures. Piers, docks, boat houses and other smaller structures in the water or by the waters can be swept away even in minor flooding and wind conditions if not properly secured. Inland marine exposure includes any antiques, collectibles, electronics, firearms, furs, jewelry, silverware, and other types of property kept on the premises and subject to sublimits and exclusions within the homeowners policy. As these items are often attractive theft targets, security features such as locks, alarms, off-premise/transit exposures and storage arrangements should be reviewed. Others items frequently used in coastal settings will include equipment used to maintain and care for a boat or yacht and other water-related equipment. Boats and yachts exposure may be a canoe, fishing boat, jet ski, kayak, pontoon boat, sailboat, speed boat, or a yacht. Many coastal property owners dock vessels on their owned premises or at a nearby marina. Boats and yachts represent property and liability exposures whether they are stored in or out of the water. Some vessels may be transported over land or by water during the off season to be used at other locations. Auto exposures are from household members driving owned, rented or borrowed vehicles or from loaning their vehicles to others outside the household. All drivers must be identified, licensed, and have acceptable MVRs. The type of vehicle, ownership, the principle driver, garaging location, miles driven, and type of driving must be considered when evaluating the exposure. Age and experience of each driver must be evaluated. Driving courses can assist drivers of any age. The exposure of household residents temporarily living away from the household exposures such as students away at college is important to explore because of potential vehicle ownership, state compliance, garaging, and usage changes. We hope this article on coastal homeowners insurance has been informative. Whether it is your primary residence or a beach vacation home, your coastal property is likely the largest investment you've made in your life. You can't leave your financial ruin to the winds of chance (or a tropical storm). Living on the coast without the right coastal home insurance is like driving without a seat belt. It might work just fine most of the time. But all it takes is one bad day and you could lose everything you value most. If you are looking for state specific coastal home insurance information: California Coastal Homeowners Insurance, Delaware Coastal Homeowners Insurance, Florida Coastal Homeowners Insurance, New Jersey Coastal Homeowners Insurance, New York Coastal Homeowners Insurance, Oregon Coastal Homeowners Insurance, Texas Coastal Homeowners Insurance, Washington Coastal Homeowners Insurance.